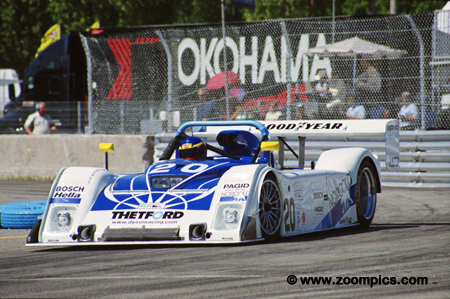 The 2001 Grand American Road Racing Championship (Grand Am) was the series second season. A business model which controlled costs, had stable rules and avoided being on dependent of automotive manufacturers attracted private teams. 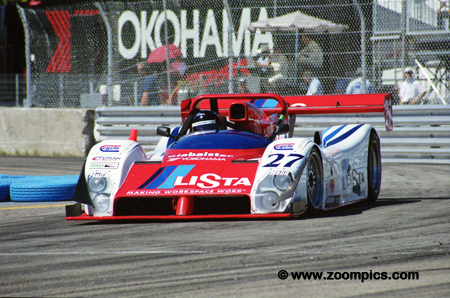 Based on the failure of the United States Road Racing Championship in 1999 critics suggested that the Grand Am would suffer a similar fate – races canceled and the season cut short. However, that was not the case and all nine events were held as scheduled. 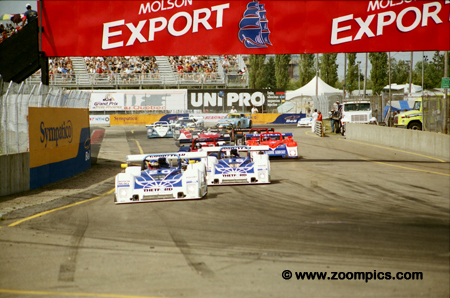 In early August the Grand Am series made their second visit to Trois-Rivieres - it was the season's eighth event. As the circuit was a very tight ten-turn 1.521-mile street layout, the decision was made to split the classes and hold two races. 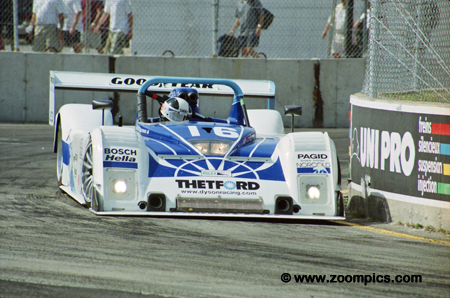 This was the second time Grand-Am divide the classes into two race groups – the first was at Lime Rock. 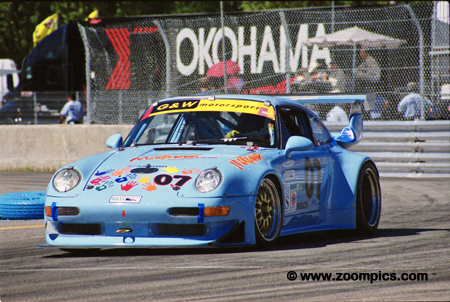 The first race group included American GT, GT and from the Grand-Am Cup division the Super Grand Sport (SGS) class. The second event the following day featured SRP I, SRP II and GTS. Sunday’s race was 92-laps with an entry of fifteen cars – (6 – SRP I, 5 – SRP II and 4 – GTS). The first green lap and the field of fifteen cars head into the corner eight hairpin named after the late Peter Ryan. 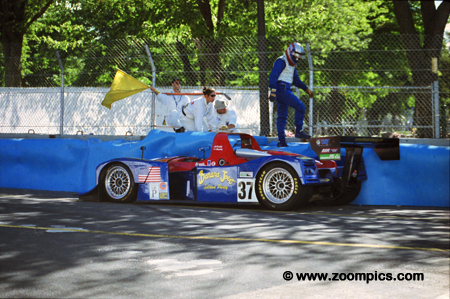 Leading is the Dyson Riley & Scott Mk III of pole-sitter Dorsey Schroeder and close behind is teammate James Weaver. There were only four cars entered in the GTS class. 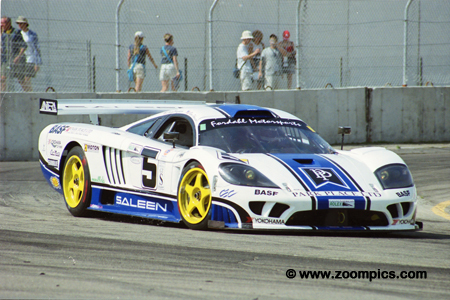 The fastest GTS qualifier, by over 3-seconds, was the Saleen S7-R driven by Chris Bingham and Ron Johnson. To date, the duo dominated the class - winning four of eight races. They had problems at Trois-Rivieres with a sticking throttle which made shifting difficult. Despite this challenge, they won the class by 3-laps. It had been two-months since the Dyson driving duo of Butch Leitzinger and James Weaver won an event. Weaver qualified second behind the other Dyson entry of Elliott Forbes-Robinson and Dorsey Schroeder. He followed Schroeder at the start but passed him on lap-31 in the first corner. Except for pit stops the No. 16 led the remainder of the race winning by a margin of 1.985-seconds. 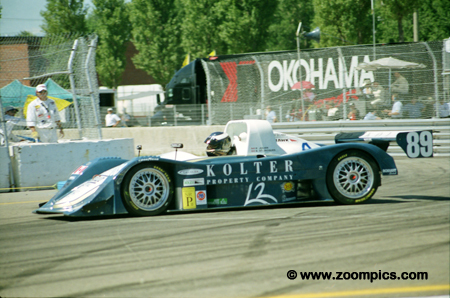 The Porschehaus Racing Lola B2K/40 lifts the right front wheel through the Trois-Rivieres’ first turn. 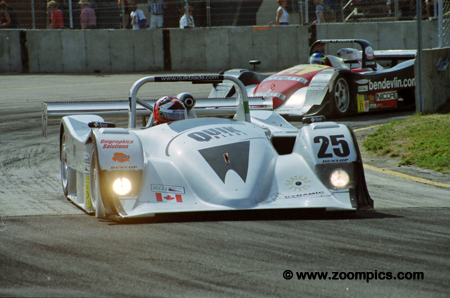 Drivers Stephane Veilleux and Jean-Francois Dumoulin qualified second in SRP II behind the series point leading Archangel Lola. The Porschehaus team passed the Archangel car and were able to capitalize on Scott Maxwell's fuel problem to capture the SRP II win. The No. 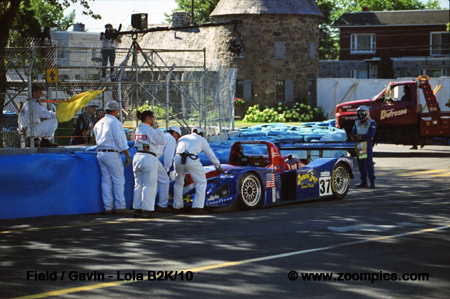 89 Lola B2K/40 was driven by Robert Julien and, series regular, Bruno St. Jacques. Julien started the car and was 2-laps down when he handed the car over to St. Jacques. St. Jacques kept setting the fastest SRP II race laps and with the demise of Maxwell finished second in class. This moved St. Jacques within three-points of championship leader Andy Lally, however, the team was not entering the final two races. With the retirement of the Intersport Lola, the only threat to the Dyson cars appeared to be the Judd-powered Ferrari 333 SP of Doran Racing. 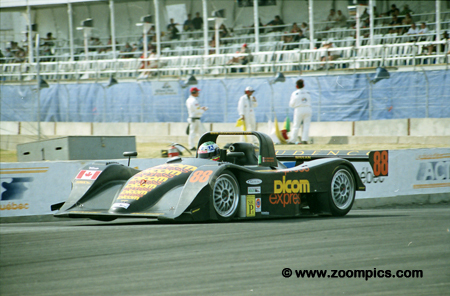 Driven by Didier Theys and Ross Bentley the car was gridded fifth. Just before the mid-point of the race, Bentley passed the 74-Ranch Riley & Scott. The team led briefly after a round of pit-stops but would finish third. Darren Law was recruited to share the G&W Motorsports Porsche 911 GT2 with regular driver Steve Marshall. It was thought the pair may be a threat to the Park Place Saleen S7-R which had been dominating GTS. Law proved to be quick in practice but the car had problems throughout the weekend. They qualified second in class but were the first car to retire with an engine failure. Scott Maxwell led much of the SRP II race but ran out of gas while trying to make it back to the pits for a 'splash and dash'. Here he is chased through the tight Ryan hairpin turn by the No. 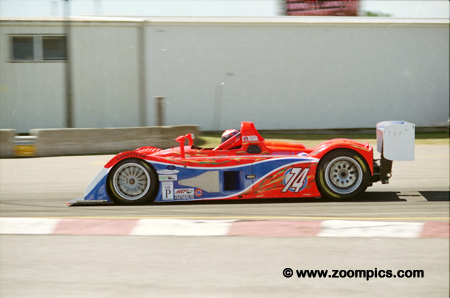 21 Archangel Lola of Ben Devlin and Jean-Francois Veilleux, which finished second in SRP II. Maxwell would finish 7-laps behind the SRP II winner and last in the category. George Robinson and Jack Baldwin shared the Robinson Racing Judd-powered Riley and Scott Mk III. They finished they started fourth and ran third for much of the race until Baldwin had problems. Mid-way through the race, he was reporting brake and gearbox problems. On lap-38, he locked his brakes and slid wide which allowed Ross Bentley to pass for third. The No. 74 car would finish fourth. James Weaver sat in the pit lane during the final minutes of qualifying with the crew believing he had won the pole. His teammate Dorsey Schroeder, in the No. 20 Riley & Scott, decided to give it another try and set the fastest qualifying time. Schroeder and his co-driver Elliott Forbes-Robinson battled with their teammates early in the race but eventually settled for a second place finish. John Field hit the tire wall during practice at the Porte Duplessis. The crew made repairs and the Lola B2K/10 that he shared with Oliver Gavin qualified third. Things did not go much better during the event as the Judd-powered car broke a drive-shaft at the start - binging out the races first full course yellow flag period. The pair completed just 14-laps.